The Worshipful Company of Glaziers and Painters of Glass was proud to continue its fine tradition of Work Placement Awards and the Stevens Competition in 2011. Each seeks to support and encourage high standards in the art and craft of stained and architectural glass, especially in the United Kingdom. Applicants must be either currently undertaking training or have completed their training within the past five years. The Company celebrated and congratulated the participants, winners and their tutors at a Seminar and Prize Giving ceremony at Glaziers Hall on 4 May, 2011. In1971 Past Master Lt.Col.T.H.G. Stevens bequeathed monies which the Company’s Court suggested be used to establish “The Lt.Col.T.H.G. Stevens Scholarship”which is now known as The Stevens Competition. This affords students the opportunity to display their skill as artists and craftsmen, with the possibility of securing a commission. Since at least 1984 the competition has involved preparing a scaled design and a sample panel in relation to a design brief. Like the Work Placement Awards, the Stevens Competition is open to those who are currently training or have completed their training within the past five years. Since 2009 it has been one of the national competitions in the portfolio of Worldskills U.K. which is backed by the government, and which holds national competitions to encourage best practice in practical and vocational occupations. 36 entries were submitted to the Stevens Competition 2011. The majority of these, 21, were from students in higher education, three from adult education, two independents and a surprising 10 who did not specify their related organisation nor independent status. Unless many of the latter were in fact independents, this suggests that the relative difficulty of the site reduced the number of independent entrants compared to recent years. Matthew Hayes of Central St Martins, won The Brian Thomas Memorial Prize, sponsored by GQA Qualifications, and with it the World Skills Gold Medal. 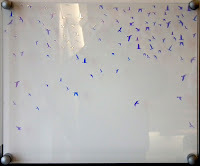 Matthew’s winning entry, pictured below, incorporated many tiny bird shaped dichroic glass inclusions which change appearance according to the angle of view and reflect what is in front of them, giving the work an interactive and fascinatingly mutable appearance to engage the viewer and offer a variety of experiences. Congratulations and thanks to all who participated in the competitions for the Work Placement Awards and the Stevens Competition, including those working independently, students and tutors at colleges, judges and interviewers, volunteers at The Worshipful Company of Glaziers, sponsors and hosts.